What's the most exciting thing you've ever done to break up a long car journey? Stopped at McDonald's? Bought a magazine? Written a friend's phone number in a toilet stall under an inventive description? Stopped for a few hours, donned a parachute and a trained skydiver and dropped out of a plane? I've done three of those four things. Lake Taupo is the southern hemisphere's largest lake, and it sits prettily against a backdrop of towering, snow-capped mountains and rolling hills. The road runs against the side of the lake and, with a following wind and a cool breeze, you could drive forever. So why not pull over, climb into a plane and then hurl yourself out again without waiting for it to land? 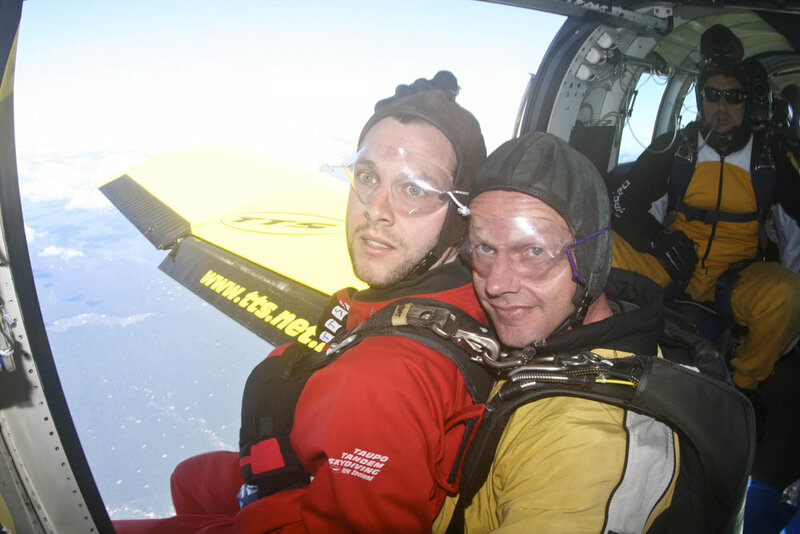 Most skydiving institutions in New Zealand offer you two choices: twelve thousand feet or fifteen thousand feet. The difference is a few seconds of freefall, so we opted for the lower of the two, and signed our health insurance away on the contract, which included a clause that said that if we got into the plane and decided not to jump, we'd pay anyway. Has that ever happened? I asked, ever so casually. Not that I know of, replied the teenager. "One woman got up there and started crying and everything. Eventually she was persuaded and when she got down she said it was the best thing she'd ever done." Crying and everything, I thought. I can top that. Suddenly, I was wearing a jumpsuit. My tandem partner was a German named Albert. Luckily, Albert seemed like a reasonably well-centered individual. As well-adjusted as you can be, I suppose, when your day job is throwing yourself from planes. Mendy did less well. She was tied to a Brazilian wearing a fluffy blue helmet who introduced himself as Jam. The view, I recall, was incredible, all tiny forests and winding, quiet roads, capped by mountains and occasional glimpses of the lake. This was ok. The plane was a bit shakey, but this was, all in all, fine. Suddenly, the door at the back of the plane was thrown open and the wind rushed in. Three professional skydivers moved to the back of the plane and stood on the ledge. They paused forever. I noticed the wind whipping the edges of their jumpsuits. They looked inexplicably happy. Then, abruptly, they were gone. One minute they were standing on the edge of the plane, and the next they had vanished . It looked violent and very, very dangerous. It struck me that this was what skydiving was: paying a great deal of money to come very close to having an appalling accident. Mendy was next. She and Jam shuffled to the front door and she sat for a moment with her legs dangling over the edge. Then, they tipped forwards, and fell. It was the falling that surprised me. I think I expected them to hover gently in the slipstream of the plane for a moment or two before descending. Instead Mendy vanished beneath the plane: if you blinked you would miss the entire thing. It was less of a jump and more of a tumble. Mine? Eyes wide, pupils dilated, mouth dry and slightly open, manically unfocussed stare. It is not the look of a man having the time of his life. It is the look of the man about to be savaged by a pack of dogs. I sat, heart thumping, on the edge of the plane. My legs dangled over the edge and I became aware of the very real possibility of my shoes blowing off in the hurricane whipping at my face. The single saving grace was that Albert didn't ask me if we ready again, because I'd have said no. Then we were out the door. My eyes were welded open and I caught a split-second glimpse of the plane and horizon spinning madly away. The acceleration was unlike anything: imagine taking off in a jet plane and times it by, I don't know, a million. It was like being roared at by God. Once you're out of the plane, there's nothing you can do. Whatever self-preservation instincts might tell you not to jump vanish because... that's it. Your life, for a few seconds, is basically over; your future as long as it's ever been and simultaneously very, very short. At that moment, at two hundred kilometres per hour and hurtling towards certain death, I could not have been happier. Then the parachute snapped open: it was like being lifted at the shoulders by a giant. The roaring stopped, and we hung in the air. We landed and, very discretely, I was the teensiest bit sick on the grass. Job jobbed.